“Therefore do not worry about tomorrow, for tomorrow will worry about its own things. Sufficient for the day is its own trouble” (Matthew 6:34 NKJV). Rolling power outages impact businesses, which is part of the reason handouts are delayed. It is hard to make copies without power to run the copiers. 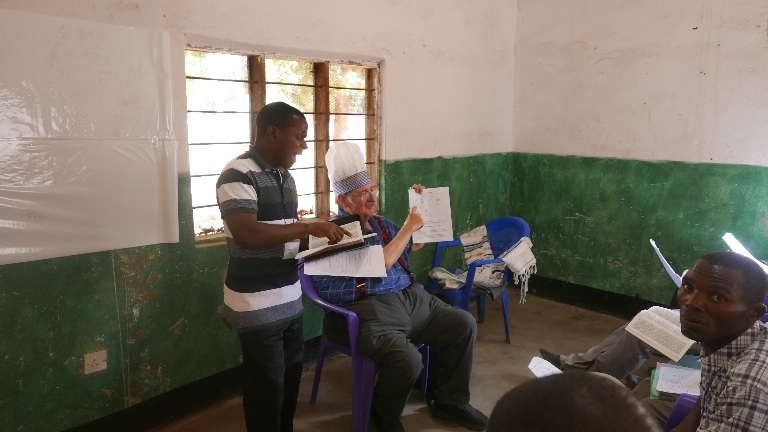 In addition, Pastor Chilemba’s son, John, who supervises and directs the copying process has been drafted as a translator and he spends all day as a translator and must work with the copy center in the evening. Beginning day three of Bible School. David suggested that we rearrange the schedule for today by combining three classes into two morning sessions. Then since both classes were already planned to be combined for the last main class session, the Returning Students will have had all their classes and can join the First Year class early and get an extra class session. This eliminated the need for one translator all afternoon and frees up John from translating to give him daytime hours to finish supervising the copying. Changing the schedule didn’t affect us much. Ian did a great job teaching about Jacob. It’s a long and convoluted story and he only went ten minutes over time. In the opening session I asked how many had cell phones. Half of the students raised their hands. I asked how many had computers and no one held up their hand. I asked how many had access to a computer and only one hand went up. Later we had an issue with supplying the extra students with materials. We had sent some money personally to buy presents for the translators, but that plan fell through, so that money is now available to buy the extra school supplies for the increased number of students. 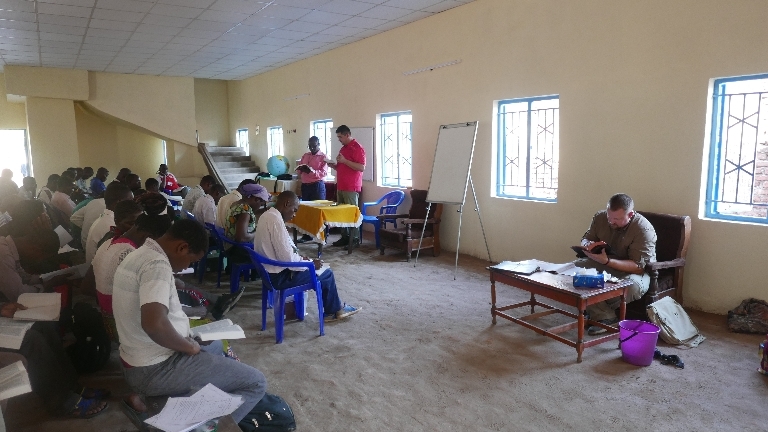 After lunch, we discussed this with Pastor Chilemba, and he agreed to use that money to by the extra pens and notebooks and other supplies needed for the extra students. God had this all worked out in advance, the money was here, we just had not understood what it was for. By the end of the day, all the students had their school supplies. That was a huge relief! After lunch Ian taught the entire one hundred forty student body about Moses and the Exodus. In the meantime David was supposed to be with John at the copy shop sorting out the copies problem. Later I found out that they didn’t even go because just before they were leaving, the shop owner called John and said they had no power and could not do anything. So the joke is on David and his planning, but he does have a good talk with John and things are actually going well. The students are getting the handouts after the class, the students pay attention in class, but they have handouts to take home when they need to refer to them later. As with everything else – it really is no problem. David teaching about Old Testament priests. John Chilemba is translating. Later today Manual stepped up to translate. Abraham had to go to the hospital because his son came down with malaria. Please pray for them. 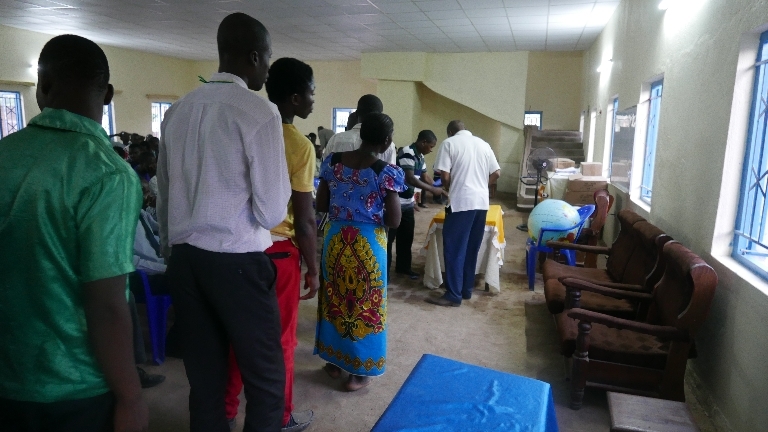 Pastor Chilemba took Mama Chilemba to the hospital this morning to check the cast on her arm. All checked out OK, but please continue to pray for quick healing. We registered our 141st student today. Please praise God for the people signing up. 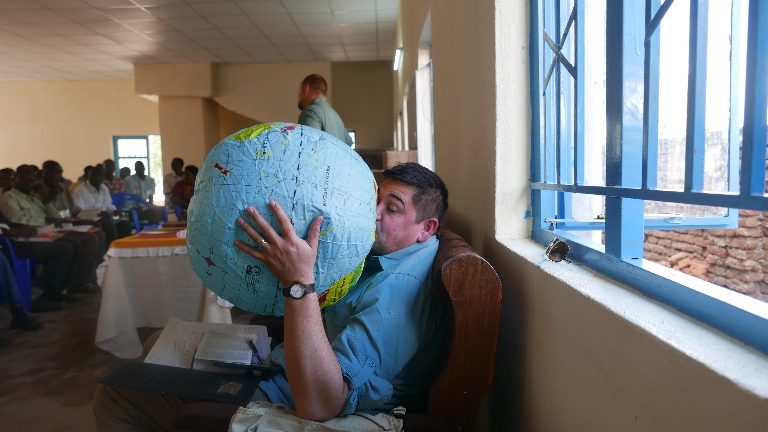 At he final session we used the inflated globes to show how far we had come to be here. Afterward, we bounced the balls through the 141 pastors for five minutes. They loved it! Ian and Joey bring much energy and excitement into play and the pastors are enjoying fun games and activities at the end of a hard day. On the home front, we have more power outages than last year. We had asked for a refrigerator and got a freezer so I have been trying to regulate it by unplugging it from time to time. I left it plugged in because we haven’t had power and the power went on after we left yesterday. We got home and the power was off again, but all our drinks, snacks, cheese, and yogurt were frozen solid. And yet it was so hot that a cold shower was welcome! 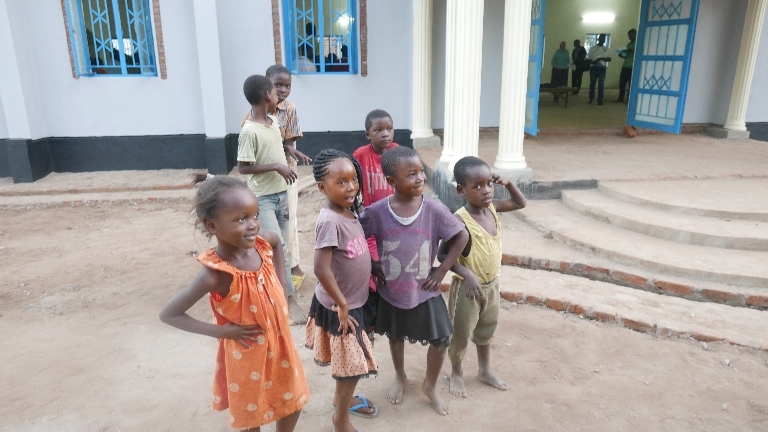 Kids posing in front of the church, the one on the left is Phillip Chilemba’s Daughter. 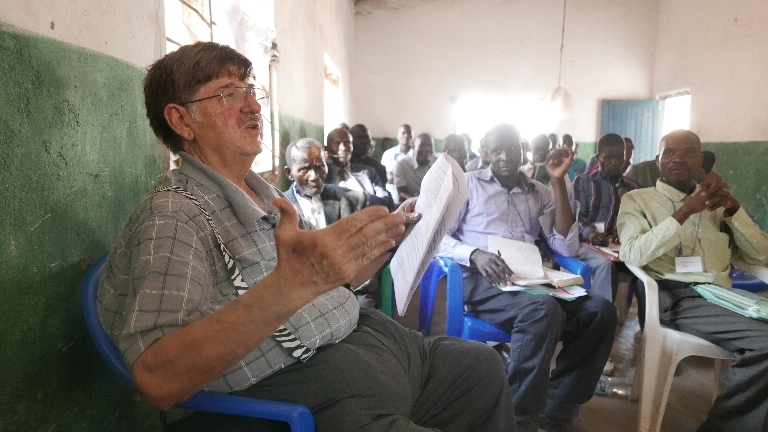 Phillip is Pastor Chilemba’s Son and one of the Pastors of the New Big Church. Joey blowing up the globe. Just another day in the 1st year classroom. A quick update on Translator Abraham’s son, he is out of the hospital and doing fine. It seems he had an asthma attack. So many things get lost in translation! He really is fine now.